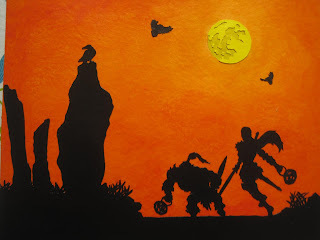 I just wanted to show everyone the original paper cut artwork entitled Smite or Treat. This scene is what graces the cover of Tales from the Game Tavern issue one. As part of a promotion the artist, Ike Horton will be graciously donating the original for a raffle. 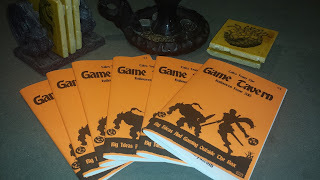 Every physical copy of the Tales from the Game Tavern issue one sold directly from ultanya.com will count as a raffle ticket. As previously mentioned our tentative plans are to announce the winner in November. SMITE OR TREAT all finished but the signature. This the closest to a traditional cut paper piece as I've done. 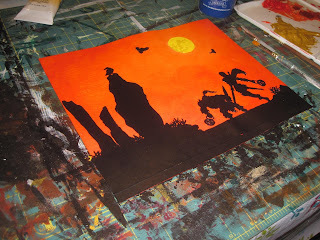 All the black silhouette parts are cut from single piece of Watercolor paper and painted a satin Mars Black. The darker crater color of the moon was painted directly on the background with Yellow Ochre with a wash of Cadmium Yellow Medium and the lighter is Watercolor paper painted with Cadmium Yellow Medium. The background is various washes of Cadmium Orange and Cadmium Red Medium mixtures. 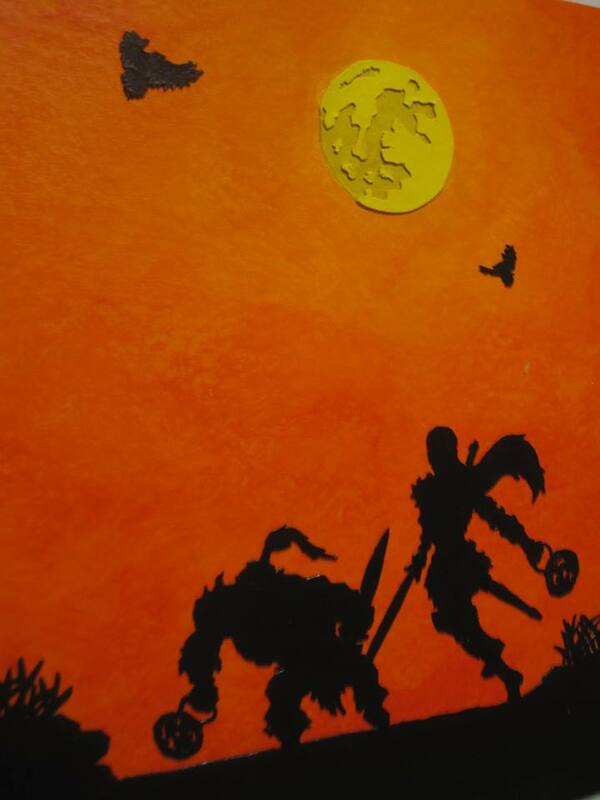 I actually own several paper cut pieces crafted by Ike and I can tell you pictures do them no justice. Very often the three dimensional aspects are not captured by a camera. Additionally the intricate cutting involved cannot be fully appreciated until you see the work in person. If you are looking for a wonderful piece of Halloween décor Smite or Treat would be a good addition. Ike also does commissions so if you get a chance check out his Facebook page and give it a like. Get your copy of issue #1 here!